Even before I read the entire book, 100 British Documentaries proved to be an indispensable resource. Two key lectures I recently presented were greatly enhanced by Patrick Russell’s research and knowledgeable opinions. Documentary film audiences in places as disparate as São Paulo, Brazil and Hollywood, California have already benefited from this small volume. Tens of thousands more readers are sure to find it equally invaluable. Part of a short series issued by the British Film Institute (curiously, other titles are not listed in this book), 100 British Documentaries joins 100 Modern Soundtracks, 100 Shakespeare Films and 100 Westerns and others as worthy guides to specialized subjects that are made distinctive by idiosyncratic — in the best, differentiating sense of that word — personal choices. Patrick Russell is Senior Curator (Non-Fiction) at the BFI National Archive. As such he is one of thousands of the usually invisible dedicated archivists who preserve our film heritage — an especially important task when that heritage is the history of our documentary past. He is an author more than qualified for the task at hand, and is also an expert whose prose is accessible, entertaining and often drolly keen-witted. Russell’s introduction sets forward the criteria for a film’s inclusion in the book; his is not a rote, AFI-like list of the “100 Best” or “100 Most Popular.” Rather, it is a sampling of good, excellent, interesting or sometimes merely representative titles. He places each in the context of British documentary history, although the list is alphabetical, not chronological. The introduction begins, “The documentary impulse has long stirred in British culture. Documentary is usually associated with realism, widely considered the most characteristic of British artistic stances. Actually, the bond between these concepts is pretty knotty. But it has underpinned claims that the documentary is, for good or ill, the British film genre.” Any student of film history is aware of the critical role that the British documentary — personified by its patriarch, John Grierson — played in the development of the form. Grierson’s “creative treatment of actuality” definition, and his insistence on the purpose of documentary to teach, continue to inform our debates about nonfiction. Documentary has evolved far beyond even Grierson’s vision, and Russell makes that point in his inclusion of work from the four-minute “phantom ride” from Cecil Hepworth’s 1898 film View from an Engine Front to video of the early 21st Century, from the well-worn classics to the obscure and experimental. The book provides the delight of seeing some favorites in new ways. Night Mail (Dirs. : Harry Watt and Basil Wright;1936) is always essential to truly understanding film, and is here affirmed in its rightful place as art, compared to John Ford’s Stagecoach as “instant archetype; freshly minted.” I am a bit hard-pressed to agree that Grierson’s Drifters (1929) deserves the similar artistic status that Russell awards it, but the fact that he deems it “compulsory” is unarguable. I would also add that adjective to Listen to Britain (Dirs. : Humphrey Jennings and Stewart McAllister; 1942), which Russell finds to be perfect propaganda. He also briefly explores why many cinephiles consider Jennings the only British nonfiction maker to be worthy of a “national canon.” Other titles are included not because they represent the best of a filmmaker’s output — i.e. Nick Broomfield’s Tracking Down Maggie (1994), instead of a better-known piece. But for Russell this film “illustrates the strengths and weaknesses of Broomfield’s mature style…a quintessentially English [and bourgeois] persona: affable, self-deprecating, perhaps disguising a manipulative side” — a reading of Broomfield that might escape North American viewers. Also listed are films perhaps peripheral to documentary history, but surely part of England’s, such as Michael Lindsay-Hogg’s rendition of the Beatles penultimate recording sessions in Let It Be (1970), with its justly famous final concert on the Apple Corps. rooftop. This astute definition of experimental documentary might well serve as a starting point for discussion of the continuous convergence of documentary and other film forms. As for definitions, Russell provides a short appendix in which currently working filmmakers such as Brian Hill and Kevin MacDonald respond to Grierson’s definition of documentary. The answers are varied — respectful, poetic, comic and even self-loathing — but serve to demonstrate that Grierson’s words still clang loudly though our documentary tradition. 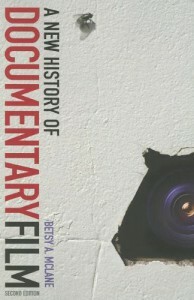 100 British Documentaries also includes a section on further reading, and here I must self-righteously complain that the 2005 book I authored with Jack C. Ellis, A New History of Documentary Film, is not included, but neither are works of Erik Barnouw or Michael Renov, so we are indeed in good company. Less forgivable is the omission of Ellis’ John Grierson: Life Contributions, Influence. This authorial snit aside, I recommend that everyone who cares about documentary, whether audience or maker, grab a copy of this handy volume. Russell’s depth of knowledge in his subject is unmatched, and his carefully considered, highly creative comments are not to be missed. My own copy is already thumbed and worn. The only thing that dulls hours of enjoyment is the fact that the films themselves are not immediately at hand. © 2008 Betsy A. McLane, Ph.D.